In June 2017, Armani was introduced to Sweet Water Foundation (SWF) through a friend who worked at the organization. “He told me to come up here to talk to Emmanuel...and that’s what I did.” Just like that, Armani began working at SWF. 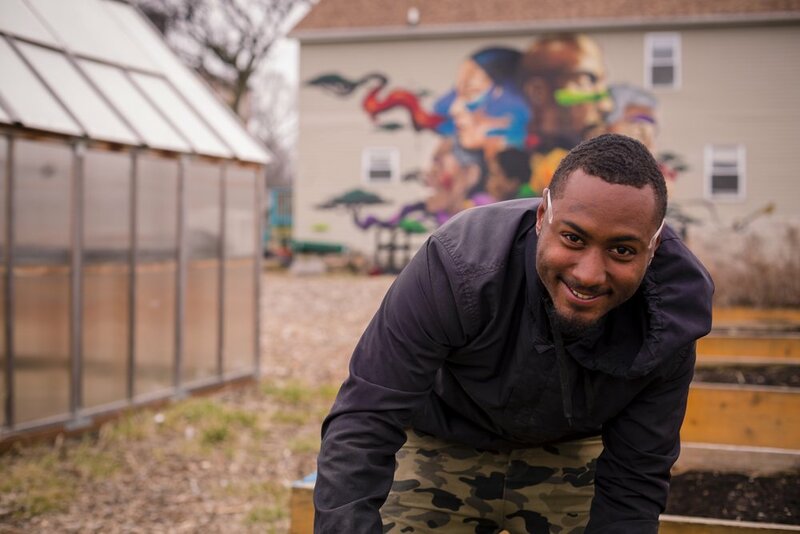 At first, his work centered on the farm, but now, Armani is a junior level apprentice, working on carpentry projects throughout the fall and winter seasons and on the farm in the summer. Since joining Sweet Water Foundation last summer, he’s grown tremendously and become a valued member of the Sweet Water Foundation team and family. I’m originally from the south suburbs in Hazel Crest, in the Homewood-Flossmoor area. I attended Homewood-Flossmoor High School and then received my Associates Degree in General Education from Prairie State College. I moved to the city when I was 18 and have been here ever since. How did you become involved in Sweet Water Foundation? I live in the neighborhood and had a friend who I would hang out with pretty frequently. He worked at Sweet Water Foundation during the summer months. He told me about SWF because he knew I was looking for something to do to make some money. He told me to come here to talk to Emmanuel, and that’s what I did. When I first started coming here, I was only here a few hours a day. But every time I was here, I left feeling better about myself. I wanted to take my newfound knowledge of farming, produce, and other things to others who maybe didn’t know so much about these things. Things like cooking eggplant. I never had an eggplant before coming here. Something rubs off on you from this space and it’s a good feeling. It’s a positive feeling. You feel really positive here and it stays with you even after you leave. What has your experience working with Sweet Water Foundation been like so far? I like working here a lot. I’ve learned a lot of different things and have gotten more interested in agriculture and wood. At first, I didn’t really think I’d like it. When I was younger, my step dad and mom would have me in the yard pulling weeds and cutting grass. So I had worked outside before helpIng out with landscaping around my parents’ house. Working on the farm has been different and it has even helped me in terms of eating. I started eating healthy. I also have plans to one day have my own garden now that I know how to start one and take care of it. What makes Sweet Water Foundation’s Apprenticeship and Outread Program stand out from other learning experiences you’ve had? At Sweet Water Foundation, we do the type of learning that I like to do. It’s hands on and we learn so many different things. Each day, especially when it gets nicer outside, we work on different projects both outside and inside, from farming to carpentry and even art. Everyday is a different. I’m gonna go out on a limb and say that hands-on learning is better than sitting in classroom reading a book or listening to a lecture. This is real education. Of course, it’s different for everyone, but I think that when you actually see everything you’re learning about while doing a hands-on project, you grasp it more. If you could learn anything else at Sweet Water Foundation, what would it be? I’d like to learn about how they were able to get this space. I want to know about the politics of the work, like when you go to council meetings or talk to the alderman. How do you go about filling out paperwork? What do you need to know to do this work in the community? I know that I want to help people, but I also know that politics is tough. That’s why something like SWF is so much better because you have direct contact with people in the community and it’s those people I want to help. My grandfather was the first black alderman of Rockford. He’s 84. So, yeah... politics has always been in the back of my mind. Would you want to start an organization like Sweet Water Foundation? Most definitely. I love it HERE at Sweet Water. But who knows what may happen in the future, and I may have the opportunity to start my own organization similar to this. That would be pretty awesome. I'm not gonna lie, I’ve thought that if I learn how Emmanuel’s doing it, I could take the skills and do it myself. It feels really good in the summertime to be able to fill people’s bellies with greens and fresh produce. Without our farm some of the community wouldn’t necessarily have access to it. I got a couple people I know that I give produce to when I get off work from Sweet Water. I’ll have 2 or 3 bags full of fresh and healthy food for people I know that like to eat healthy, but can’t with the prices in stores, especially for organic food. What do you think of the Sweet Water Foundation team? I like the people I work with. I, especially, like having conversations with older people who have a lot more life experience than I do because they can give a different perspective and help you to stay on the right path. There’s also younger guys, like Devontae. He’s younger than me, but it’s amazing what he has done the past few years of his life. In that regard, I look up to him. Being a union carpenter at his age and an entrepreneur is inspiring. He’s doing the work that he genuinely likes enjoys. Growing up, that was one of the things that was really tough for me. I didn’t know what I wanted to get up and do every morning for a career. But since being here, I’ve realized that I want to do something to help people in the community. At Sweet Water Foundation, I like how close we are with the community. I feel like I am helping and bringing something to the table to help the younger apprentices in the program. I have gotten a lot more comfortable talking to people. I remember first when I first came here; they kept stressing, family... “we’re a family you know?” After being here a little while, I really felt that. I know the Sweet Water team has my best interest at hand. A lot of other places - whether it’s work or school or even just the people you’re around on a daily basis or at home or in the neighborhood - people don’t really have your best interest at hand and It really hurts. But here, at Sweet Water Foundation you know that they do, so that makes you want to continue to come back. I love it.